Wine O'Clock - Write for Wine: It's Wine O'Clock Somewhere!Write for Wine: It's Wine O'Clock Somewhere! 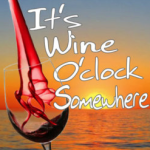 One of the mottos of Write for Wine is “It’s wine o’clock somewhere!” In fact, this blog can also be viewed at wineoclock.us. The phrase “it’s wine o’clock” initially came in 2003 from Peter, a London friend of Margot and Dave, who live in Washington state. Every Friday, at 5:30 p.m. in London, Peter would tell Margot that it’s wine o’clock. In WA, it was the beginning of the day. As a result, Margot added “somewhere” to Peter’s phrase and adopted it as her own. You will now see it in her posts on Write for Wine, Facebook and Twitter. And the phrase “It’s wine o’clock somewhere” never fails to inspire creative responses from other wine enthusiasts. So thank you, Peter and cheers – it’s wine o’clock somewhere! Thank you for coming into Alexandria Nicole Cellars in Woodinville! It was good to see you again. Hope you liked the Quarry Butte! Thanks for the nice comment. We loved the 2004 Quarry Butte, and I intend to write about it and the new release soon. We haven’t opened the 2004 Cabernet Sauvignon yet. But the taste was great — we love wine from Alexandria Nicole Cellars. Thanks for your kind words. Please email your URL to me so I can have a look and add it to my blogroll. Ok Margot, it’s 2011, Let’s meet up in Woodinville with Shona and Maureen.